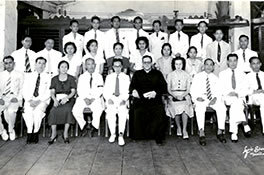 Throughout the 1930s, the Columban mission in the Philippines was proceeding and developing well. Columban Father Edward J. McCarthy became alarmed with the rise of anti-Catholic political and theological sentiments in the Philippines, particularly at the University of the Philippines. Father McCarthy then led the formation of Student Catholic Action (SCA), an organization to promote Catholicism among young Filipinos, especially college students. SCA actually officially began in 1936, with an approval by Archbishop Michael O’Doherty of Manila, but its real work began in early 1937, when it expanded outside the University of Manila, forming chapters in most of the schools in the Archdiocese of Manila, and began preparing students for the 33rd International Eucharistic Congress. The SCA also began in earnest to organize Masses, train catechists, and foster Catholic values in 1937. The SCA suspended most of its activities during the World War II years, but after the war it continued to expand to other areas of the Philippines. Currently, the SCA maintains chapters in around 300 schools and colleges in the Philippines. The modest idea that Father McCarthy proposed in the 1930s has become a robust, active organization.